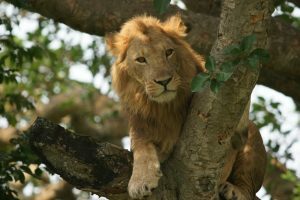 This 5 days Uganda safari tour is inclusive of a Uganda wildlife safari to Queen Elizabeth National Park Uganda; the second largest National Park in Uganda where you will encounter with several animals as they carry on their daily life in this natural habitat. Queen Elizabeth National Park is a notable safari destination famous for wildlife tours, chimpanzee trekking safaris, Uganda birding safaris and boat cruises. During you game drive in the park, in your 4×4 safari Landcruiser or 4×4 safari van, expect to see several animals and birds. Chimpanzees can be cited during trekking in Kalinzu forest. More animals and birds can be spotted during the boat cruise along the Kazinga channel; a river that joins Lake Edward and Lake Albert. You will be amazed with spectacular sceneries that are found with in the park like the crater lakes and the rolling savannah plains overlooking the snowcapped Rwenzori Mountains. Finally, our 5 days Uganda safari will take you to a magical wonderland; Lake Bunyonyi Uganda also known as a birding paradise. The name “Bunyonyi” means many birds therefore while here, you will have an unforgettable birding adventure experience as well as a boat cruise visiting the islands in the lake. This safari will start and end in Kampala. You will depart Bunyonyi and travel back to Kampala with a stopover for lunch in Mbarara town. You will continue the journey and arrive in Kampala in the late afternoon.